The great folks over at KRUPS sent over some waffle making tips along with their KRUPS original waffles recipe and their bananas foster waffles recipe for me to share with all of my readers. They look delicious!!! 2. 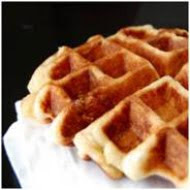 Heat your waffle iron for at least 10 minutes before pouring the batter in, or your waffles will not rise properly and you will have heavy and flat waffles. 3. Take it easy! Don’t mix the batter too quickly or vigorously. Use a slow, even tempo to get the right consistency, or your waffles will be tough and chewy. 4. No peeking! We know you’re hungry. But your patience will be reward. Don’t lift the lid too early or you will let out the steam. 5. Always finding yourself in sticky situations? Do not use cooking spray on your waffle iron. Instead, use a vegetable oil. Just take a basting brush or a paper towel and cover the surface lightly with oil. Your waffle iron will last much longer, and, in the end, you will have fewer problems with sticking. It also helps to produces a better crust on the waffle. Preheat KRUPS F654 Waffle Iron. Beat eggs in large bowl with hand beater until fluffy. Beat in flour, milk, vegetable oil, sugar, baking powder, salt and vanilla, just until smooth. Brush oil on preheated waffle iron. Pour mix onto hot waffle iron. Cook until golden brown. Serve hot. In a large skillet, combine corn syrup, brown sugar, maple syrup and pecans. Bring to a boil over medium-high heat. Reduce heat, and simmer for 2 minutes. Add banana slices and rum extract. Coat with the syrup mixture, and simmer 1 minute. Spoon over waffles. Serve immediately.